There are different levels of dry scalp. Some itching and dryness are caused by a skin condition, such as psoriasis. Other people deal with dandruff. Others, still, simply have these symptoms from external factors. No matter the cause of a dry scalp, finding a soothing daily treatment option, like Selsun Blue Itchy Dry Scalp, can help. Medicated shampoos like this can help to get rid of the symptoms associated with dry scalp. Because it is an over-the-counter product, it’s made for regular use. For best results, you can rotate your shampoos on a daily basis, making this an active part of your rotation, so your scalp can fully heal and stop itching. Selsun Blue contains six added moisturizers and conditioners to get rid of dry scalp and provide relief from itching and dandruff. Not only will it remove the itching and scaling, but it will leave your hair soft and shiny, as well. If you do suffer from a dry scalp, you know it can affect your skin, as well as your hair. Using shampoo like this regularly will fight back against both problems. It’s an easy-to-use solution that is meant to work right away. But, is it the right one for you? Want to Get a Bottle? CLICK HERE to Buy this Selsun Shampoo on Amazon! Is the Formula Safe for Daily Use? Will it Work for Colored Hair? Will Selsun Blue Itchy Dry Scalp Provide Relief? 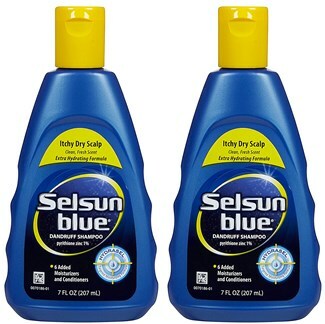 This review will cover the important features of Selsun Blue Itchy Dry Scalp. With so many types of medicated shampoos on the market, it’s important to consider which features might be the most beneficial for your dry scalp. We’ll cover the questions you may be asking yourself before making this type of purchase, so you can be confident in whether or not this is the product that will provide relief. Selsun Blue will treat almost any dry scalp condition. It works especially well for people dealing with seborrheic dermatitis and dandruff. The specialized formula is specifically designed to eliminate flaking, scaling, and itching. There have been multiple customer reviews stating the product also works well for symptoms of scalp psoriasis. Conditions like psoriasis or eczema may never be fully treatable. But, being able to control the symptoms and alleviate itching and pain is the goal. Dry scalp can often be caused by elements such as cosmetic hair products, or even the weather. 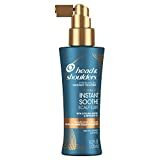 Even if you don’t have a specific skin condition, but you’re experiencing itching and flaking, this shampoo can help you find relief and restore your scalp and hair to a healthy state. This shampoo contains six different moisturizing agents to give your hair shine and alleviate an itchy scalp. The active ingredient is Pyrithione Zinc (1%). This ingredient works as an antifungal agent, and also helps to prohibit bacteria from growing and thriving. That’s why the shampoo is so effective on multiple scalp conditions. It is one of the most widely-used ingredients for fighting dandruff. If you’re prone to dry scalp, you should avoid washing your hair every day with any shampoo. The chemicals in certain shampoos, combined with hot water, and continue to irritate your skin and strip it from needed nutrients. However, this shampoo is made to be regularly used and is safe to apply several times a week. There are a few ingredients, such as fragrances and preservatives, that some people are more sensitive to than others. While they aren’t necessarily harmful, they may cause additional irritation. Take a look at the full ingredient list to make sure you aren’t allergic to anything included in the formula. This shampoo is meant to clear up the symptoms of a dry scalp quickly. If the formula makes your condition worse, or you don’t see improvement within, stop use immediately. This shampoo is blue when it comes out of the bottle. However, once a lather has formed on the scalp, and through the hair, the blue color goes away. If you have white or gray hair, the blue will not change this in any way. If you have color-treated hair, it is also safe and won’t cause the color to fade. Keep in mind that the more you use any shampoo, the faster your color will eventually dull. It is recommended that you use Selsun Blue twice a week for best results. You’ll protect your hair color and your scalp at the same time, without drying out the hair or doing and additional damage to your skin. Selsun Blue works great as a dandruff shampoo, but it may not be for everyone. Let’s take a look at some of the major pros and cons to consider for this product. There is a Selsun Blue shampoo available that is made from a natural formula for anyone who feels more comfortable using all-natural ingredients. However, side effects from this shampoo are scarce. No matter what type of scalp condition you may have, Selsun Blue Itchy Dry Scalp Relief can help to alleviate the irritating symptoms. Dandruff can be embarrassing. Itching can lead to other issues, like an infection. Your scalp will be healthier when you’re able to find relief from these symptoms. Not only will you notice a difference in the look and feel of your scalp, but your hair will be restored to health with this shampoo, too. It’s a great solution for anyone who is tired of itching and scratching their head every day. Hopefully, you’ve found our review useful. With so many anti-dandruff and anti-itch shampoos on the market, choosing the best one can be difficult. Selsun Blue is a brand that is not only trusted by medical professionals but remains one of the most popular names in dandruff control. If you’re looking for something potent enough to get rid of scalp itch, but gentle enough to use a few times a week, this is a great option. CLICK HERE to Read More Customer Reviews, View FAQs, and Check Current Prices!